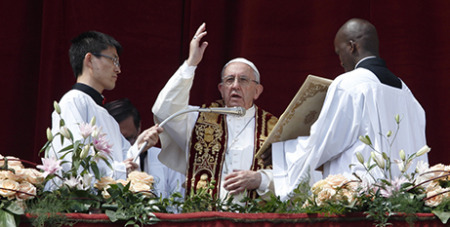 Pope Francis reminded Christians on Easter Sunday that the Resurrection is the cornerstone of our faith, CNA reports. “This throwaway culture,” he said, where we use something and then throw it away, “where what is not needed is rejected, the stone – Jesus – is discarded” but then becomes the source of eternal life. “Brothers and sisters, this is what I wanted to tell you. Go home now, repeating in your heart: ‘Christ is risen,’” he concluded. Following Mass, Francis gave the traditional “Urbi et Orbi” blessing from the balcony of St. Peter’s Basilica. In his prayer, the Pope listed by name some of the current conflict zones around the world, especially the Middle East, Africa, South America and Ukraine, and called for peace in those regions of ongoing violence. In particular, he named an attack which took place on the outskirts of Aleppo in Syria on Saturday. A bomb blast on a crowded Syrian bus convoy killed at least 112 people, the Syrian Observatory for Human Rights monitoring group said on Sunday. The Pope also prayed for all those caught in forms of slavery and for all those forced to leave their home because of conflict, terrorism, famine or oppressive regimes. “In every age, the Risen Shepherd tirelessly seeks us, his brothers and sisters, wandering in the deserts of this world. With the marks of the passion – the wounds of his merciful love – he draws us to follow him on his way, the way of life,” he said.